Commercial space company Blue Origin achieved a huge milestone by successfully launching their New Shepard rocket to suborbital space and landing it dead center on target – and upright – back at their proving grounds in West Texas. This is the first successful landing of a reusable vertical takeoff, vertical landing (VTVL) rocket that has reached space. “This flight validates our vehicle architecture and design,” said founder Jeff Bezos, the billionaire who also started Amazon.com. Blue Origin’s New Shepard reusable rocket standing upright after returning from an altitude of 329,839 feet (100.5 kilometers). Credit: Blue Origin. The suborbital flight launched Monday, November 23, 2015 at 11:21 a.m. CST from West Texas, reaching an altitude of 329,839 feet (100.5 kilometers) and a speed of Mach 3.72, which is about 2,854 mph (4,593 km/h), according a press release posted on the Blue Origin website. Bezos said it was “flawless mission” for the Blue Origin team and for the reusable rocket, powered by the company’s own BE-3 engine, which uses liquid hydrogen and liquid oxygen and produces 110,000-lbf thrust. The capsule also landed successfully, returning to Earth on 3 parachutes. Blue Origin released a video of the flight — which was not a crewed flight. The video oddly goes from actual footage of the launch to an animation of a crew inside the capsule, and then back to footage of the booster landing. The goal of the New Shepard fully-reusable spacecraft is to carry people on suborbital spaceflights to experience weightlessness and view the Earth through the largest windows to ever fly in space. Science can also be done on these suborbital mission. On April 29 of this year, Blue Origin flew the first developmental test flight of the New Shepard space vehicle. The engine worked flawlessly on launch, sending the rocket to its planned test altitude of 307,000 feet (58 miles, or 93.5 km). But the landing failed when pressure was lost in the hydraulic system on descent. The Blue Origins team celebrates their successful test flight on Nov. 23, 2015. Credit: Blue Origin. Bezos has said he was inspired as a child watching the Apollo missions to the Moon. “You don’t choose your passions; your passions choose you,” he told CNN. Later, SpaceX CEO Elon Musk tweeted his congratulations: “Congrats to Jeff Bezos and the BO team for achieving VTOL on their booster.” But then, Musk also wanted to state the difference in what Blue Origin achieved and what SpaceX is trying to do with their resuable Falcon. Fierce commercial and international political pressures have forced the rapid development of the new Vulcan launcher family recently announced by rocket maker United Launch Alliance (ULA). Vulcan’s “genesis” and development was borne of multiple unrelenting forces on ULA and is now absolutely essential and critical for its “transformation and survival in a competitive environment” moving forward, according to Dr. George Sowers, ULA Vice President for Advanced Concepts and Technology, in an exclusive interview with Universe Today. “To be successful and survive ULA needs to transform to be more of a competitive company in a competitive environment,” Dr. Sowers told Universe Today in a wide ranging interview regarding the rationale and goals of the Vulcan rocket. Vulcan is ULA’s next generation rocket to space and slated for an inaugural liftoff in 2019. Faced with the combined challenges of a completely changed business and political environment emanating powerfully from new space upstart SpaceX offering significantly reduced launch costs, and continuing uncertainty over the future supply of the Russian-made RD-180 workhorse rocket engines that power ULA’s venerable Atlas V rocket, after Russia’s annexation of Crimea, Sowers and ULA’s new CEO Tory Bruno were tasked with rapidly resolving these twin threats to the firms future well being – which also significantly impacts directly on America’s national security. “Our current plan is to have the new Vulcan rocket flying by 2019,” Sowers stated. Whereas ULA enjoyed a virtual US launch monopoly for many years, those days are now history thanks to SpaceX. The Vulcan launcher was created in response to the commercial SpaceX Falcon 9 rocket, and it will combine the best features of ULA’s existing unmanned Atlas V and Delta IV booster product lines as well as being revamped with new and innovative American-made first stage engines that will eventually be reusable. It will meet and exceed the capabilities of ULA’s current stable of launchers, including the Delta IV Heavy which recently launched NASA’s maiden Orion crew module on an unmanned test flight in Dec. 2014. “So that was really the genesis of what we now call the “Vulcan” rocket. So this single family will be able to do everything [from medium to heavy lift],” Sowers told me. Another requirement is that Vulcan’s manufacturing methodology be extremely efficient, slashing costs to make it cost competitive with the Space X Falcon 9. Sowers said the launcher would sell “for less than $100 million” at the base level. “Vulcan will be the highest-performing, most cost-efficient rocket on the market. It will open up new opportunities for the nation’s use of space,” says ULA CEO Tory Bruno. In its initial configuration Vulcan’s first stage will be powered by a revolutionary new class of cost effective and wholly domestic engines dubbed the BE-4, produced by Blue Origin. It can be augmented by up to six solid rocket boosters, to propel high value payloads on missions ranging from low Earth orbit to interplanetary destinations for NASA, private industry and vital US national security interests. Vulcan will also blast off with astronaut crews aboard the Boeing CST-100 space taxi bound for the International Space Station (ISS) in the early 2020s. Further upgrades including a powerful new upper stage called ACES, will be phased in down the road as launches of ULA’s existing rocket families wind down, to alleviate any schedule slips. ULA was formed in 2006 as a 50:50 joint venture between Lockheed Martin and Boeing that combined their existing expendable rocket fleet families – the Atlas V and Delta IV – under one roof. Development of the two Evolved Expendable Launch Vehicles (EELV’s) was originally funded by the U.S. Air Force to provide two independent and complimentary launch capabilities thereby offering assured access to space for America’s most critical military reconnaissance satellites gathering intelligence for the National Reconnaissance Office (NRO), DOD and the most senior US military and government leaders. 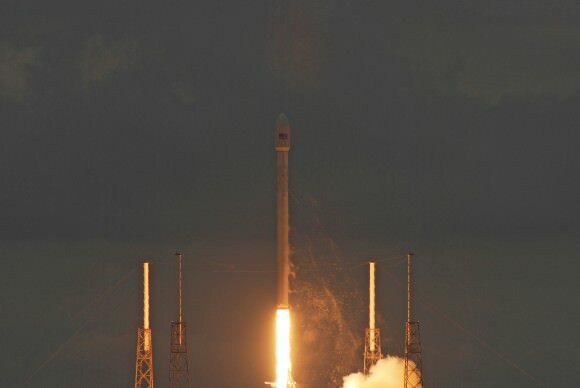 Since 2006, SpaceX (founded by billionaire Elon Musk) has emerged on the space scene as a potent rival offering significantly lower cost launches compared to ULA and other launch providers in the US and overseas – and captured a significant and growing share of the international launch market for its American-made Falcon rocket family. ULA Atlas V rocket first stage is powered by Russian-made RD-180 engines. “ULA was formed eight years ago as a government regulated monopoly focused on US government launches. Now eight years later the environment is changing,” Sowers told me. How did ULA respond to the commercial and political challenges and transform? “So there are a lot of things we had to do structurally to make that transformation. One of the key ones is that when ULA was formed, the government was very concerned about having assured access to space for national security launches,” Sowers explained. ULA actually offered three rocket families after the merger, when only one was really needed. Developing a new first stage engine not subject to international tensions was another primary impetus. The RD-180’s will be replaced with a pair of BE-4 engines from Blue Origin, the highly secretive aerospace firm founded by Jeff Bezos, billionaire founder of Amazon. The revolutionary BE-4 engines are fueled by liquefied natural gas and liquid oxygen and will produce about 1.1 million pounds of thrust vs. about 900,000 pounds of thrust for the RD-180, a significant enhancement in thrust. Although the BE-4 is ULA’s primary choice to replace the RD-180, ULA is also investing in development of a backup engine, the AR-1 from Aerojet-Rocketdyne, in case the BE-4 faces unexpected delays. More on the Vulcan, BE-4, reusability and more upcoming in part 2. Meanwhile, the next commercial SpaceX Falcon 9 is due to blastoff this Sunday, June 28, on the Dragon CRS-7 resupply mission to the ISS. Watch for my onsite reports from the Kennedy Space Center and Cape Canaveral Air Force Station in Florida. The orbital airframe structure for the first commercial Dream Chaser mini-shuttle that will launch to Earth orbit just over two years from now has been unveiled by Sierra Nevada Corporation (SNC) and program partner Lockheed Martin. Sierra Nevada is moving forward with plans for Dream Chaser’s first launch and unmanned orbital test flight in November 2016 atop a United Launch Alliance (ULA) Atlas V rocket from Cape Canaveral, Florida. The winged Dream Chaser is being developed under NASA’s Commercial Crew Program aimed at restoring America’s indigenous human spaceflight access to low Earth orbit and the International Space Station (ISS). Lockheed Martin is fabricating the structural components for the Dream Chaser’s orbital spacecraft composite structure at the NASA’s Michoud Assembly Facility (MAF) in New Orleans, Louisiana. MAF has played a long and illustrious history in human space flight dating back to Apollo and also as the site where all the External Tanks for NASA’s space shuttle program were manufactured. Lockheed Martin also builds the pressure vessels for NASA’s deep space Orion crew vehicle at MAF. Each piece is thoroughly inspected to insure it meets specification and then shipped to Lockheed Martin’s Aeronautics facility in Fort Worth, Texas for integration into the airframe and co-bonded assembly. Following helicopter release the private Dream Chaser spaceplane starts glide to runway at Edwards Air Force Base, Ca. during first free flight landing test on Oct. 26, 2013 – in this screenshot. Credit: Sierra Nevada Corp.
Sierra Nevada chose Lockheed Martin for this significant role in building Dream Chaser airframe based on their wealth of aerospace experience and expertise. The composite airframe structure was recently unveiled at a joint press conference by Sierra Nevada Corporation and Lockheed Martin at the Fort Worth facility. “As a valued strategic partner on SNC’s Dream Chaser Dream Team, Lockheed Martin is under contract to manufacture Dream Chaser orbital structure airframes,” said Mark N. Sirangelo, corporate vice president of SNC’s Space Systems, in a statement. Dream Chaser measures about 29 feet long with a 23 foot wide wing span and is about one third the size of NASA’s space shuttle orbiters. “We are able to tailor our best manufacturing processes, and our innovative technology from across the corporation to fit the needs of the Dream Chaser program,” said Jim Crocker, vice president of Lockheed Martin’s Space Systems Company Civil Space Line of Business. Upon completion of the airframe manufacturing at Ft Worth, it will be transported to SNC’s Louisville, Colorado, facility for final integration and assembly. Lockheed Martin will also process Dream Chaser between orbital flights at the Kennedy Space Center, FL in the recently renamed Neil Armstrong Operations and Checkout Building. SNC announced in July that they successfully completed and passed a series of risk reduction milestone tests on key flight hardware systems under its Commercial Crew Integrated Capability (CCiCap) agreement with NASA that move the private reusable spacecraft closer to its critical design review (CDR) and first flight. As a result of completing Milestones 9 and 9a, SNC has now received 92% of its total CCiCAP Phase 1 NASA award of $227.5 million. “We are on schedule to launch our first orbital flight in November of 2016, which will mark the beginning of the restoration of U.S. crew capability to low-Earth orbit,” says Sirangelo. The private Dream Chaser is a reusable lifting-body design spaceship that will carry a mix of cargo and up to a seven crewmembers to the ISS. It will also be able to land on commercial runways anywhere in the world, according to SNC. Dream Chaser is among a trio of US private sector manned spaceships being developed with seed money from NASA’s Commercial Crew Program in a public/private partnership to develop a next-generation crew transportation vehicle to ferry astronauts to and from the International Space Station by 2017 – a capability totally lost following the space shuttle’s forced retirement in 2011. The SpaceX Dragon and Boeing CST-100 ‘space taxis’ are also vying for funding in the next round of contracts to be awarded by NASA around September 2014, NASA officials have told me. Stay tuned here for Ken’s continuing Sierra Nevada, Boeing, SpaceX, Orbital Sciences, commercial space, Orion, Rosetta, Curiosity, Mars rover, MAVEN, MOM and more planetary and human spaceflight news. WALLOPS ISLAND, VA – Just days ago, the Obama Administration approved NASA’s request to extend the lifetime of the International Space Station (ISS) to at least 2024. Ultimately this will serve as a stepping stone to exciting deep space voyages in future decades. “I think this is a tremendous announcement for us here in the space station world,” said Bill Gerstenmaier, associate administrator for NASA’s Human Exploration and Operations Mission Directorate, at a press briefing on Jan. 8. But there’s really “no reason to stop it there”, said Frank Culbertson, VP at Orbital Sciences and former NASA astronaut and shuttle commander, to Universe Today when I asked him for his response to NASA’s station extension announcement. “It’s fantastic!” Culbertson told me, shortly after we witnessed the picture perfect blastoff of Orbital’s Antares/Cygnus rocket on Jan. 9 from NASA’s Wallops launch facility in Virginia, bound for the ISS. Gerstenmaier emphasized that the extension will allow both the research and business communities to plan for the longer term and future utilization, be innovative and realize a much greater return on their investments in scientific research and capital outlays. “The station is really our stepping stone,” Robert Lightfoot, NASA Associate Administrator, told me at Wallops following Antares launch. The Alpha Magnetic Spectrometer (AMS) – which is searching for elusive dark matter – was one of the key science experiments that Gerstenmaier cited as benefitting greatly from the ISS extension to 2024. The AMS is the largest research instrument on the ISS. The extension will enable NASA, the academic community and commercial industry to plan much farther in the future and consider ideas not even possible if the station was de-orbited in 2020 according to the existing timetable. Both the Antares rocket and Cygnus cargo freighter are private space vehicles developed and built by Orbital Sciences with seed money from NASA in a public-private partnership to keep the station stocked with essential supplies and research experiments and to foster commercial spaceflight. So I asked Culbertson and Lightfoot to elaborate on the benefits of the ISS extension to NASA, scientific researchers and commercial company’s like Orbital Sciences. Birds take flight as Antares lifts off for Space Station from Virginia Blastoff of Antares commercial rocket built by Orbital Sciences on Jan. 9, 2014 from Launch Pad 0A at NASA Wallops Flight Facility, VA on a mission for NASA bound for the International Space Station and loaded with science experiments. The Cygnus Orbital 1 cargo vehicle launched on Jan. 9 was loaded with approximately 2,780 pounds/1,261 kilograms of cargo for the ISS crew for NASA including vital science experiments, computer supplies, spacewalk tools, food, water, clothing and experimental hardware. The research investigations alone accounted for over 1/3 of the total cargo mass. It included a batch of 23 student designed experiments representing over 8700 students sponsored by the National Center for Earth and Space Science Education (NCESSE). What does the ISS extension mean for Orbital? The purpose for NASA and Orbital Sciences in building Antares and Cygnus was to restore America’s ability to launch cargo to the ISS – following the shutdown of NASA’s space shuttles – by using commercial companies and their business know how to thereby significantly reduce the cost of launching cargo to low Earth orbit. “As far as what it [the ISS extension] means for Orbital and other commercial companies – Yes, it does allow us to plan long term for what we might be able to do in providing a service for NASA in the future,” Culbertson replied. What does the ISS extension mean for NASA? The ISS extension is also the pathway to future exciting journey’s beyond Earth and into deep space, Culbertson and Lightfoot told Universe Today. “It actually also presents a business opportunity that can be expanded not just to the station but to other uses in spaceflight, such as exploration to Asteroids, Mars and wherever we are going,” said Culbertson. Lightfoot described the benefits for astronaut crews. “The further out we go, the more we need to know about how to operate in space, what kind of protection we need, what kind of research we need for the astronauts,” said Lightfoot. “Orbital is putting systems up there that allow us to test more and more. Get more time. Because when we get further away, we can’t get home as quick. So those are the kinds of things we can do. He emphasized the benefits for students, like those who flew experiments on Cygnus, and how that would inspire the next generation of explorers! “That’s pretty cool! And that’s exactly what we need to be doing! “And it really is important to have this station extension,” Lightfoot explained to me. The Jan. 9 launch of the Orbital-1 mission is the first of eight operational Antares/Cygnus flights to the space station scheduled through 2016 by Orbital Sciences under its $1.9 Billion Commercial Resupply Services (CRS) contract with NASA to deliver 20,000 kg of cargo to orbit. Orbital Sciences and SpaceX – NASA’s other cargo provider – will compete for follow on ISS cargo delivery contracts. The next Antares/Cygnus flight is slated for about May 1 from NASA Wallops. In an upcoming story, I’ll describe Orbital Sciences’ plans to upgrade both Antares and Cygnus to meet the challenges of the ISS today and tomorrow. Stay tuned here for Ken’s continuing Orbital Sciences, SpaceX, commercial space, Chang’e-3, LADEE, Mars and more news. With the Moon as a spectacular backdrop, an Orbital Sciences’ Cygnus cargo spacecraft speeding at 17500 MPH on a landmark flight and loaded with a huge treasure trove of science, belated Christmas presents and colonies of ants rendezvoued at the space station early this Sunday morning (Jan. 12), captured and then deftly parked by astronauts guiding it with the Canadian robotic arm. Cygnus is a commercially developed resupply freighter stocked with 1.5 tons of vital research experiments, crew provisions and student science projects that serves as an indispensible “lifeline” to keep the massive orbiting outpost alive and humming with the science for which it was designed. Following a two day orbital chase that started with the spectacular blastoff on Jan. 9 atop Orbital’s private Antares booster from NASA Wallops Flight Facility, Va., Cygnus fired its on board thrusters multiple times to approach in close proximity to the million pound International Space Station (ISS) by 3 a.m. Sunday. When Cygnus had moved further to within 30 feet (10 meters) NASA Astronaut and station crew member Mike Hopkins – working inside the Cupola – then successfully grappled the ship with the stations 57 foot long Canadarm2 at 6:08 a.m. EST to complete the first phase of today’s operations. “Capture confirmed,” radioed Hopkins as the complex was flying 258 miles over the Indian Ocean and Madagascar. “Congratulations to Orbital and the Orbital-1 team and the family of C. Gordon Fullerton,” he added. The ship is named in honor of NASA shuttle astronaut G. Gordon Fullerton who passed away in 2013. “Capturing a free flyer is one of the most critical operations on the ISS,” explained NASA astronaut and ISS alum Cady Coleman during live NASA TV coverage. Koichi Wakata of the Japan Aerospace Exploration Agency then took command of the robotic arm and maneuvered Cygnus to berth it at the Earth-facing (nadir) port on the station’s Harmony Node at 8:05 a.m while soaring over Australia. 16 bolts will be driven home and 4 latches tightly hooked to firmly join the two spacecraft together and insure no leaks. The Orbital -1 spaceship is conducting the first of 8 operational cargo logistics flights scheduled under Orbital Sciences’ multi-year $1.9 Billion Commercial Resupply Services contract (CRS) with NASA that runs through 2016. The purpose of the unmanned, private Cygnus spaceship – and the SpaceX Dragon – is to restore America’s cargo to orbit capability that was terminated following the shutdown of NASA’s space shuttles. Cygnus and Dragon will each deliver 20,000 kg (44,000 pounds) of cargo to the station according to the NASA CRS contracts. “This cargo operation is the lifeline of the station,” said Coleman. The six person crew of Expedition 38 serving aboard the ISS is due to open the hatch to Cygnus tomorrow, Monday, and begin unloading the 2,780 pounds (1,261 kilograms) of supplies packed inside. 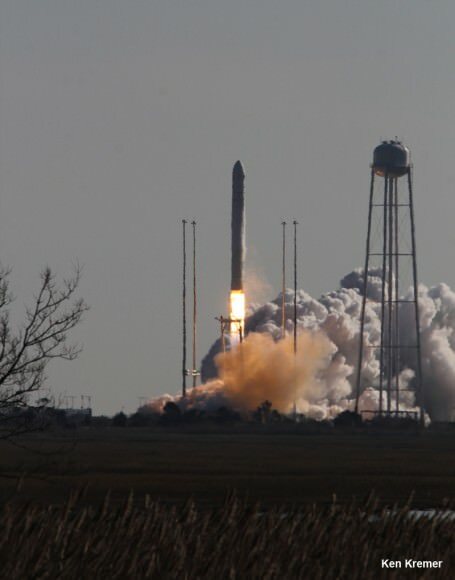 “Our first mission under the CRS contract with NASA was flawlessly executed by our Antares and Cygnus operations team, from the picture-perfect launch from NASA’s Wallops Flight Facility to the rendezvous, capture and berthing at the space station this morning,” said Mr. David W. Thompson, Orbital’s President and Chief Executive Officer, in a statement from Orbital. Science experiments weighing 1000 pounds account for nearly 1/3 of the cargo load. Among those are 23 student designed experiments representing over 8700 K-12 students involving life sciences topics ranging from amoeba reproduction to calcium in the bones to salamanders. The students are part of the Student SpaceFlight Experiments Program (SSEP) sponsored by the National Center for Earth and Space Science Education (NCESSE). Ant colonies from three US states are also aboard, living inside 8 habitats. The “ants in space” experiment will be among the first to be unloaded from Cygnus to insure the critters are well fed for their expedition on how they fare and adapt in zero gravity. 33 cubesats are also aboard that will be deployed from the Japanese Experiment Module airlock. “One newly arrived investigation will study the decreased effectiveness of antibiotics during spaceflight. Another will examine how different fuel samples burn in microgravity, which could inform future design for spacecraft materials,” said NASA in a statement. Cygnus is currently scheduled to remain berthed at the ISS for 37 days until February 18. The crew will reload it with all manner of no longer need trash and then send it off to a fiery and destructive atmospheric reentry so it will burn up high over the Pacific Ocean on Feb. 19. Cygnus departure is required to make way for the next cargo freighter – the SpaceX Dragon, slated to blast off from Cape Canaveral, Florida on Feb. 22 atop the company’s upgraded Falcon 9. Watch for my ongoing Antares/Cygnus reports. WALLOPS ISLAND, VA – The Cygnus commercial resupply freighter is hurtling towards the International Space Station (ISS) at 17,500 MPH following the flawless Jan. 9 blastoff from NASA Wallops Island, Va., atop the Orbital Sciences Corp. Antares rocket. Cygnus is bound for the ISS on its historic first operational mission to deliver over 1.5 tons of science experiments, provisions and belated Christmas presents to the six man crew aboard the massive orbiting outpost, under Orbital Science’s $1.9 Billion resupply contract with NASA. See our up close photo and video gallery of the spectacular Jan 9. Launch – above and below. The privately built Cygnus cargo vessel is in the midst of a two and a half day high speed orbital chase and is scheduled to rendezvous and dock with the station early Sunday morning, Jan 12. The Orbital-1 ship is named the “SS C. Gordon Fullerton” in honor of NASA space shuttle astronaut C. Gordon Fullerton who later worked at Orbital Sciences and passed away in 2013. The imagery was shot by remote cameras set up all around the NASA Wallops Launch Pad 0A as well as from the media viewing site some 2 miles away. Currently, the Cygnus spacecraft is barely 12 hours from its carefully choreographed arrival at the station on Sunday morning. “All Cygnus systems are performing as expected with no issues,” said Orbital Sciences in an update. “Cygnus will maneuver to a distance of about 30 feet from the station,” said Frank Culbertson, executive vice president and general manager of Orbital’s advanced spaceflight programs group, and former Space Shuttle commander. The goal of Orbital Sciences Cygnus – and the Space X Dragon – is to restore America’s cargo delivery capabilities to low Earth orbit and the ISS that was totally lost following the forced retirement of NASA’s Space Shuttles, by utilizing new and privately developed resupply freighters that will cuts costs. Cygnus is packed with 2,780 pounds (1261 kg) of station supplies and vital research experiments. Expedition 38 crew members Engineers Mike Hopkins and Koichi Wakata aboard the station will reach out and with the stations 57 foot long Canadarm2 and grapple Cygnus with the robotic arm on Sunday at 6:02 a.m. EDT. Hopkins and Wakata will then carefully maneuver the robot arm and guide Cygnus to its berthing port on the Earth-facing side of the Harmony node. The installation begins around 7:20 a.m. EDT. And NASA TV will provide continuous live coverage of Cygnus rendezvous, docking and berthing operations. The majestic blastoff of Orbital Science’s two stage Antares rocket took place from a beachside pad at NASA’s Wallop’s Flight Facility along the eastern shore of Virginia, Thursday, at 1:07 p.m. EST. The station was flying about 260 miles over the Atlantic Ocean just off the coast of Brazil as Antares soared aloft. The solar arrays deployed as planned once Cygnus was in Earth orbit to provide life giving energy required to command the spacecraft. The picture perfect launch of the 133 foot tall Antares put on a spectacular sky show following a trio of delays since mid- December 2013. The first postponement was forced when spacewalking astronauts were called on to conduct urgent repairs to fix an unexpected malfunction in the critical cooling system on board the station. Then, unprecedented frigid weather caused by the ‘polar vortex’ forced a one day from Jan. 7 to Jan. 8. Finally, an unexpected blast of solar radiation from the Earth’s Sun on Tuesday (Jan. 7) caused another 24 postponement because the highly energetic solar particles could have fried the delicate electronics controlling the rockets ascent with disastrous consequences. Cygnus is loaded with science experiments, computer supplies, spacewalk tools, food, water, clothing and experimental hardware. “The crew will unload Cygnus starting probably the next day after it docks at station,” said Culbertson. Among the research items packed aboard the Cygnus flight are an experiment to study the effectiveness of antibiotics in space and a batch of 23 student experiments involving life sciences topics ranging from amoeba reproduction to calcium in the bones to salamanders. The student experiments selected are from 6 middle school and high school teams from Michigan, Texas, Colorado, and Washington, DC. WALLOPS ISLAND, VA – A private Antares rocket thundered off a Virginia launch pad today (Jan. 9) bound for the International Space Station on a breakthrough mission that marks the second successful commercial rocket launch by an American aerospace company this week – a feat that’s sure to send shock waves reverberating around the globe as well as providing an absolutely crucial life line to the station. The majestic blastoff of Orbital Science’s Antares rocket took place from a beach side pad at NASA’s Wallop’s Flight Facility along the eastern shore of Virginia, Thursday, at 1:07 p.m. EST. A flock of birds flew by just as Antares soared off the pad – see my lucky shot above. The milestone flight was conducted under Orbital’s $1.9 Billion contract to NASA as the firm’s first operational cargo delivery flight to the ISS using their own developed Cygnus resupply vehicle. “Today’s launch gives the cargo capability to keep the station going,” said Frank Culbertson, executive vice president and general manager of Orbital’s advanced spaceflight programs group, and former Space Shuttle commander. And with the ISS lifetime in Earth orbit now newly extended by the Obama Administration to 2024, the resupply freighters pioneered by Orbital Sciences and SpaceX – in partnership with NASA – are even more important than ever before to keep the station well stocked and humming with an ever increasing array of research projects. The goal was to restore America’s cargo and crew capabilities to low Earth orbit and the ISS that was totally lost following the forced retirement of NASA’s Space Shuttles. Cygnus is packed chock full with a myriad of science experiments for dozens of new NASA science investigations as well as two dozen student science experiments from school across the country. Both the terrestrial and space weather forecasts improved dramatically in the final hours of the countdown and cooperated to allow today’s magnificent Antares launch. The launch of the two stage, 133 foot tall Antares put on a spectacular sky show that may – because of crystal clear skies – have been visible to millions of spectators spread across the US east coast from the Carolina’s to Connecticut. Antares beautiful liftoff on Thursday comes on the heels of Monday’s (Jan. 6) SpaceX Falcon 9 liftoff . Furthermore, it marks a grand success for the innovative US strategy of forging low cost, reliable and effective access to space by handing the task of building the rockets and cargo vehicles to US commercial companies for routine jobs in Earth orbit while NASA focuses on investing in deep space exploration. “Today’s launch demonstrates how our strategic investments in the American commercial spaceflight industry are helping create new jobs here at home and keep the United States the world leader in space exploration,” NASA Administrator Charles Bolden said in a NASA statement. The fourth launch attempt was finally the charm after a trio of postponements since mid- December 2013 to fix the malfunctioning cooling system on the station, unprecedented frigid weather and then an unexpected blast of solar radiation from the Sun on Tuesday (Jan. 7) that could have fried the delicate electronics controlling the rockets ascent with disastrous consequences. Both the Antares and Cygnus are private vehicles built by Orbital Sciences under a $1.9 Billion supply contract with NASA to deliver 20,000 kilograms of research experiments, crew provisions, spare parts and hardware to the ISS. Orbital Sciences commercial competitor, SpaceX, is likewise under contract with NASA to deliver 20,000 kg of supplies to the ISS with the SpaceX Falcon 9/Dragon architecture. Both the Orbital Sciences Antares/Cygnus and SpaceX Falcon 9/Dragon vehicles were developed from the start with seed money from NASA in a public-private partnership. The flight is designated the Orbital-1, or Orb-1 mission. A total of eight Antares/Cygnus missions to the space station are scheduled over the next two to three years by Orbital under its Commercial Resupply Services (CRS) contract with NASA. Two additional Antares/Cygnus flight are slated for this year. They are slated to lift off around May 1 and early October, said Culbertson. This launch follows a pair of successful launches in 2013, including the initial test launch in April and the 1st demonstration launch to the ISS in September. Cygnus is loaded with approximately 2,780 pounds / 1,261 kilograms of cargo for the ISS crew for NASA including science experiments, computer supplies, spacewalk tools, food, water, clothing and experimental hardware. 33 cubesats are also on board that will be deployed over time by the 6 person crew living aboard the ISS. Among the research items packed aboard the Antares/Cygnus flight are an experiment to study the effectiveness of antibiotics in space and a batch of 23 student experiments involving life sciences topics ranging from amoeba reproduction to calcium in the bones to salamanders. The student experiments selected are from middle school and high school teams from Michigan, Texas, Colorado, and Washington, DC. There is also an ant farm aboard with ant colonies from Colorado, North Carolina and of course host state Virginia too. The goal is to study ant behavior in space in zero gravity and compare that to ants on Earth living under normal gravity. Cygnus will rendezvous with the station on Sunday, Jan 12. Expedition 38 crew members aboard the station will grapple Cygnus with the stations robotic arm Sunday at 6:02 a.m. EDT. NASA TV will provide live coverage of Sunday’s docking. Watch for my ongoing Antares launch reports from on site at NASA Wallops. WALLOPS ISLAND, VA – Catching a slim weather break amidst the monster blizzard and unprecedented arctic air low temperatures afflicting the central and northern United States, Orbital Sciences Corp. is marching forward with plans for a spectacular daylight blastoff of the firms privately developed Antares rocket and Cygnus cargo spacecraft on Wednesday, Jan. 8 from a beachside pad at NASA Wallops Island, VA – on a critical mission for NASA bound for the Space Station carrying a huge cargo of vital science experiments. Here’s our complete guide on “How to See the Antares/Cygnus Jan. 8 Blastoff” – chock full of viewing maps and trajectory graphics (above and below) from a variety of prime viewing locations; including historic landmarks in Washington, DC., NYC, Baltimore, Philadelphia, Virginia and more. The cold weather, daytime Antares liftoff is currently scheduled for 1:32 p.m. EST from Launch Pad 0A at the Mid-Atlantic Regional Spaceport (MARS) at NASA Wallops, Virginia. Antares will be the 2nd of two private rockets soaring to space this week. And the path up is clear following today’s successful blastoff of the SpaceX upgraded Falcon 9 with the Thaicom-6 commercial telecom satellite. Due to continuing extremely cold weather conditions forecast for mid week, the launch could slip a day to Thursday, Jan. 9 when slightly warmer temperatures are expected, but it looks acceptable at this time. This flight was originally due to blastoff at night in mid-December 2013 but was postponed due to the unexpected need for urgent repairs to get the stations critical cooling system restored to full operation following a malfunction. The fixes were accomplished during a pair of pre-Christmas spacewalks by American astronauts Rick Mastracchio and Mike Hopkins, paving the way for the Antares/Cygnus rescheduled liftoff. And although it’s now moved to daylight due to orbital mechanics, the two stage Antares rockets exhaust plume should easily be visible to many millions of residents up and down the US East Coast spanning from South Carolina to Massachusetts – weather permitting. Antares will be able to be seen by spectators inland as well, reaching potentially into portions of West Virginia, western Pennsylvania and New England depending on cloud cover. For example; Here’s the expected view from the US Capitol – for all the politicians who decide NASA’s budget as well as myriads of tourists visiting from all across the globe. The viewing maps are courtesy of Orbital Sciences, the private company that developed both the Antares rocket and Cygnus resupply vessel aimed at keeping the International Space Station (ISS) fully stocked and operational for science research. Up top is the time of first sighting map showing when the rocket reaches 5 degrees of elevation in the eastern United States. And with yet another cold arctic air mass gushing towards eastwards, its certain to be frigid in many regions – so be sure to dress warmly. Orb-1 is the first of eight commercial cargo resupply missions to the ISS by Orbital under its Commercial Resupply Services (CRS) contract with NASA. So here’s your chance to witness a mighty rocket launch – from the comfort of your home from locations along the east coast. Best viewing of all will be in the mid-Atlantic region closest to Wallops Island. If you have the opportunity to observe the launch locally, you’ll get a magnificent view and hear the rockets thunder at either the NASA Wallops Visitor Center or the Chincoteague National Wildlife Refuge/Assateague National Seashore. The rocket was rolled out to the Wallops launch pad on Sunday by Orbital’s technicians. Of course you can still view the launch live via the NASA TV webcast. A launch on either Jan. 8 or Jan. 9 will result in a grapple of Cygnus by the Expedition 38 crew aboard the station on Sunday, Jan. 12 at at 6:02 a.m. EDT. Weather outlook appears rather promising at this time – 90% favorable chance of lift off. CAPE CANAVERAL AIR FORCE STATION, FL – The flawless blastoff of SpaceX’s next generation Falcon 9 rocket on Tuesday Dec. 3 put on a spectacular sky show along the Florida Space Coast that was both beautiful and unforgettable – besides being truly historic as the firms first ever delivery of a commercial space satellite to the lucrative market of geostationary orbit. For your enjoyment here’s a collection of photos and videos from fellow space photojournalists of the 5:41 p.m. EST sunset launch from Space Launch Complex 40 (SLC-40) at Cape Canaveral Air Force Station, FL. Following a pair of launch scrubs last week on Nov. 25 and Thanksgiving Day Nov. 28 caused by issues with the powerful new Merlin 1-D first stage engines, the third time was fat last the charm as the Falcon 9 blasted precisely at the opening of the 86 minute launch window. Stay tuned here for continuing SpaceX & MAVEN news and Ken’s SpaceX and MAVEN launch reports from on site at Cape Canaveral & the Kennedy Space Center press site.